Leaders of the Church of Jesus Christ of Latter-day Saints (also known as the Mormon Church) reaffirmed their position that women should not be eligible for the priesthood this past weekend at the semiannual General Conference in Salt Lake City. The Mormon priesthood is different than the priesthood in some other faiths. All worthy male members of the church are eligible to begin priesthood service when they reach age 12, and men may hold various offices in the priesthood – such as deacon, teacher, priest, elder or high priest – at different stages in their lives. A group of women reportedly attempted to gain entry to last weekend’s all-male priesthood session, but they were not allowed in. “Most church members would see such efforts as divisive,” LDS Church spokeswoman Ruth Todd said in a statement, according to The Salt Lake Tribune. 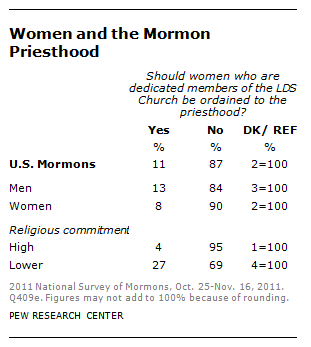 A 2011 Pew Research Center survey found that most U.S. Mormons oppose the idea of female membership in the priesthood. Asked whether women who are dedicated members of the LDS Church should be ordained to the priesthood, 87% of U.S. Mormons said no, while 11% said yes. Mormon women are somewhat more likely than men to oppose the idea of women in the priesthood. Fully nine-in-ten Mormon women (90%) say women should not be ordained, compared with 84% of Mormon men. The survey measured the religious commitment of respondents based on questions about the importance of religion, frequency of prayer and frequency of worship attendance. The belief that women should be ordained to the priesthood is held least among those who have the highest levels of religious commitment; just 4% of Mormons in that group say women should be ordained, while 95% say they should not. Even among Mormons with lower levels of religious commitment, however, nearly seven-in-ten (69%) say women should not be eligible for the priesthood.